Google has removed the specific address of the business in the 3-pack listings, instead only showing the street name. This means that in order for a searcher to find a business's exact address they need to either click through to the website (using the new Website button) or to click the Directions button (also new) to visit the map listing. Also, a searcher will no longer have quick access to the phone number of each business. This information has also been removed and the searcher will need to click through to the website to get this information. The mobile version of the 3-Pack doesn't display the phone number, but does have a "Call" button for each listing. In an interesting move, Google has removed the link to the business’s Google+ page. Recently Google pushed local businesses to claim their Google+ page, which makes this move slightly mysterious. These Google+ pages contain valuable information about the business including address, telephone number, business hours, link to website, reviews and photos. Google has added the business's hours of operation in the new 3-Pack. Depending on the time of day of the search, this information will show opening and/or closing times. They have also updated the label on the reviews for each business. Previously they were shown as "Google Reviews", now they are just "reviews". 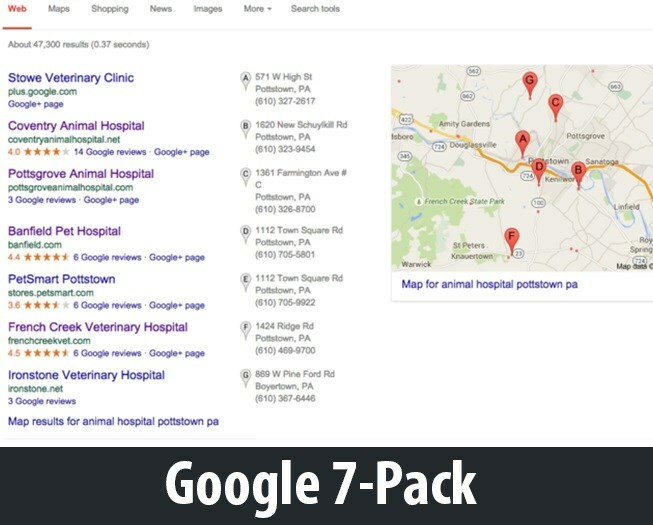 Previously, with the 7-Pack a searcher could scroll over the local listing to see more information about the business. This would show in the local card, displayed on the right hand side of the search results. With the 3-Pack, this no longer happens. To find this local card, with more business info, the searcher will have to click through to the secondary local page. When a searcher clicks on a listing in the 3-Pack (anywhere other than the Website button) they are taken to a secondary local page. This page will show the company's information along with 20 other local listings. This is a big shakeup for local results. Businesses that were accustomed to showing in the 7-pack could see a large drop in traffic to their website. This could put even more importance in high organic rankings, but many believe it may be Google's way to get more businesses to jump into pay-per-click (Google Adwords). The world of local SEO has definitely gotten more competitive.